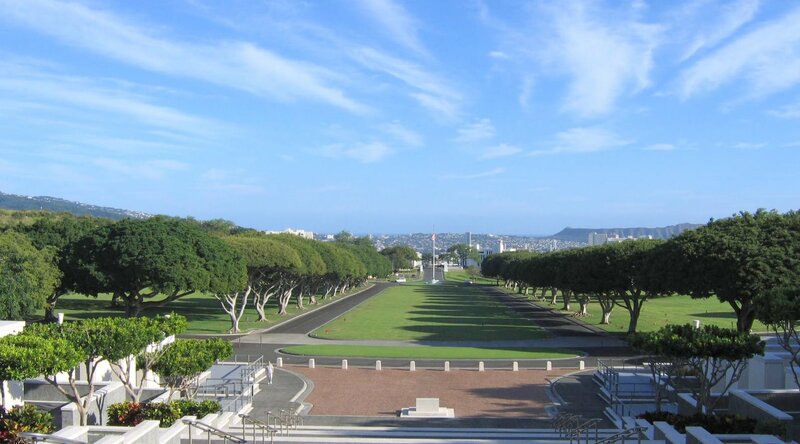 You can find the National Memorial Cemetery of the Pacific on the island of Oahu. Locals generally refer to the area to as Punchbowl. Punchbowl is a volcanic cinder cone formed over 75,000 years ago. Ancient Hawaiians called this geologic formation, Puowaina or Hill of Sacrifice. This is because kahunas or priests made human sacrifices to pagan gods here. After World War II, Congress and veteran organizations sought a permanent burial site for fallen servicemen in Hawaii. They selected Punchbowl as the most preferable location those who died in the Pacific Basin theater. Here, you can pay respects to a number of famous and notable people. They include World War II Medal of Honor recipients Barney F. Hajiro, Martin May and Allan Ohata. You can visit the grave sites of US senators and World War II veterans Spark Matsunaga and Daniel Inouye. Perhaps the most famous grave here is of Ernie Pyle, the Pulitzer Prize-winning World War II correspondent. Others include Korean War Medal of Honor recipient Herbert Pililaau and Ellison Onizuka. Ellison Onizuka was Hawaii’s first astronaut who tragically died in the Space Shuttle Challenger disaster. Today, the Veterans Administration administers the National Memorial Cemetery of the Pacific. It has become one of Hawaii’s most popular attractions with more than 5 million visitors annually. Visitors coming here to pay their respects as well as to enjoy the views of the city of Honolulu. In fact, Punchbowl has possibly the best scenic panorama of downtown Honolulu. In addition, you can get commanding views of Waikiki, Diamond Head and west Honolulu, including Honolulu International Airport. Panda Travel ® can bring you to the Aloha State to view such historic locations, such as the National Memorial Cemetery of the Pacific, through a wide range of all inclusive Hawaii vacation packages. But it can also arrange local tours and side trips to such areas. Check out our vacation packages, activities and tours online at Panda ® Online.